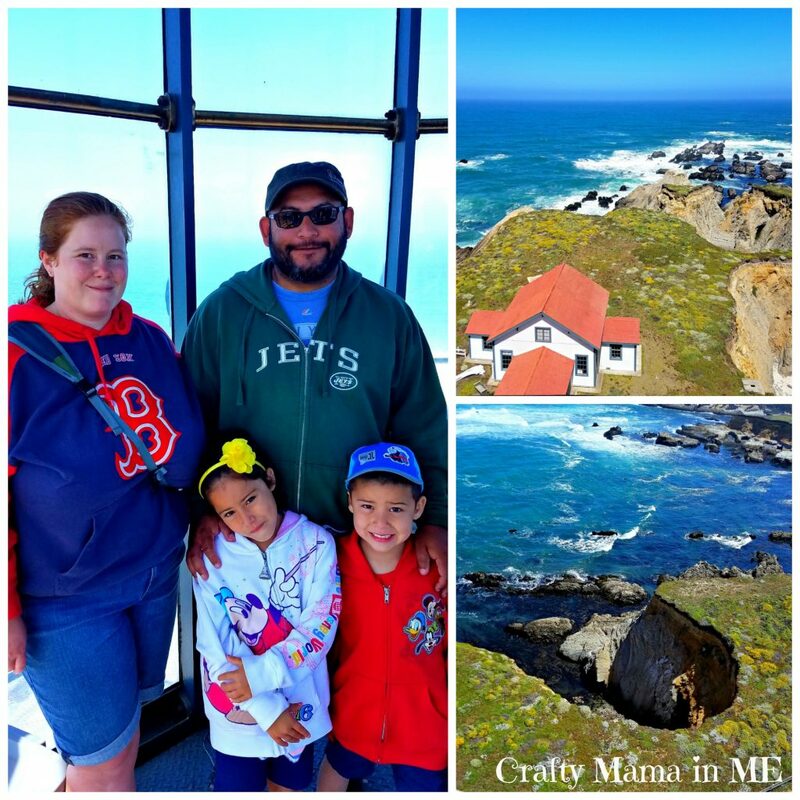 Visiting the Point Arena Lighthouse with Children - Crafty Mama in ME! 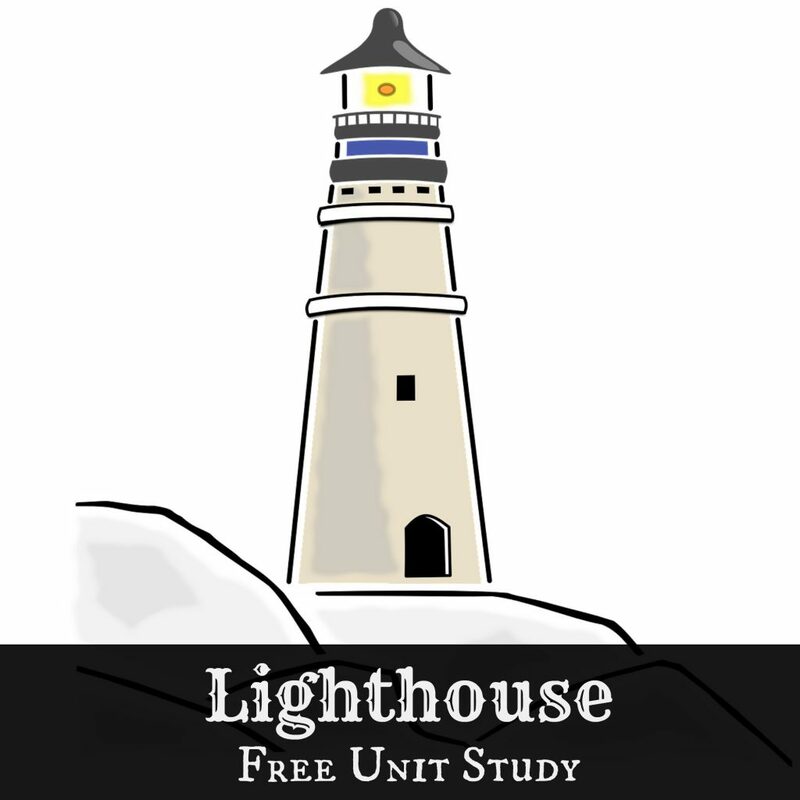 Do you love visiting lighthouses? If so and you live in California or will be visiting you should definitely check out the Point Arena Lighthouse. As most of my readers know we recently went on a vacation to California. We travelled throughout northern California in an RV and one of our stops was at the Lighthouse. 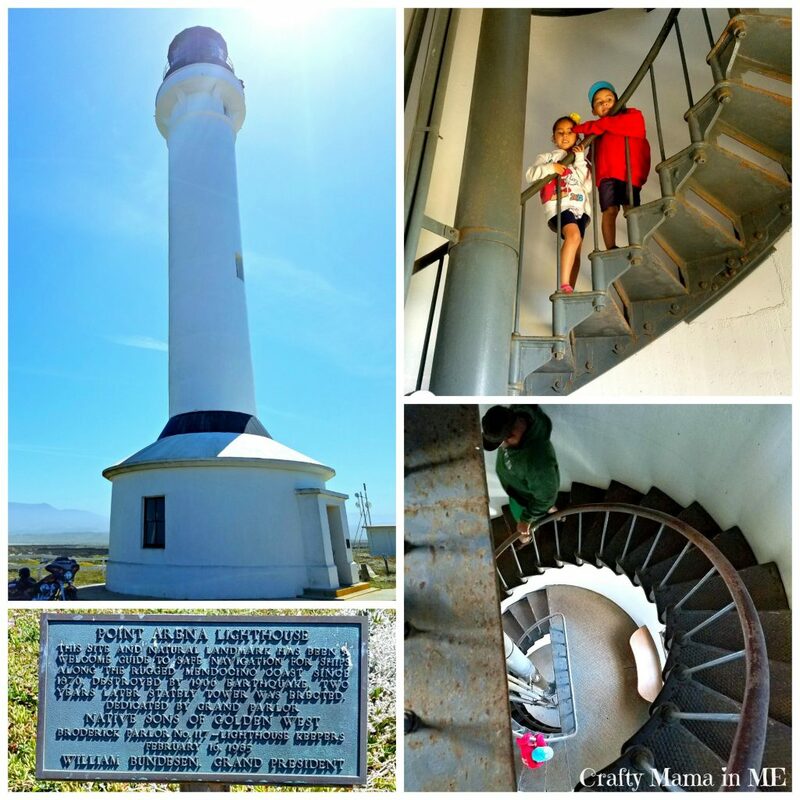 I would definitely recommend visiting the Point Area Lighthouse with children as it was very family friendly. 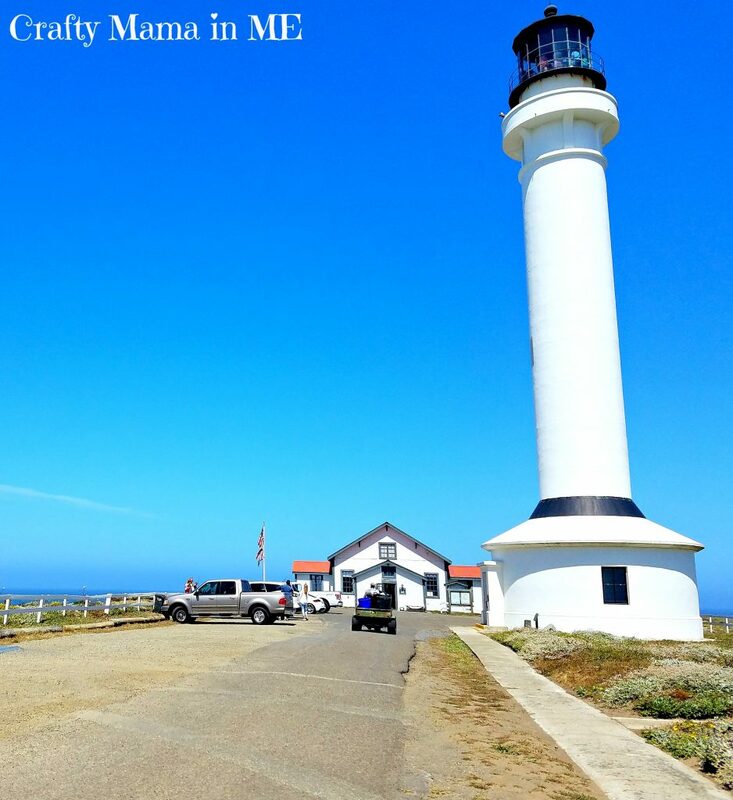 The Point Arena Lighthouse is between a 2-4 hour drive from most points in the Bay Area and Sacramento and located off of the scenic Highway 1. We visited the Lighthouse on Day 5 of our RV trip. The night before our visit we made the short drive from Fort Bragg down on Highway 1 and stayed at the KOA in Manchester Beach. We headed to the Point Arena Lighthouse first thing in the morning. The lighthouse opened for the day at 10am and we were there shortly after. We were unsure of the parking situation close to the lighthouse so we parked outside the gate at a scenic overlook. We shouldn’t have worried as when we walked in there was plenty of parking for cars and RV’s. The views were incredible at the overlook! We walked in past the gate where you pay admission (click here for current rates) and up towards the lighthouse. As we walked in (you should drive) on the road to the right there were lodging accommodations. The accommodations are private and amazing! I spoke with Mark, the Executive Director of The Point Arena Lighthouse, and he stated they were in the process of renovating the units. I would love to stay there on a future visit. 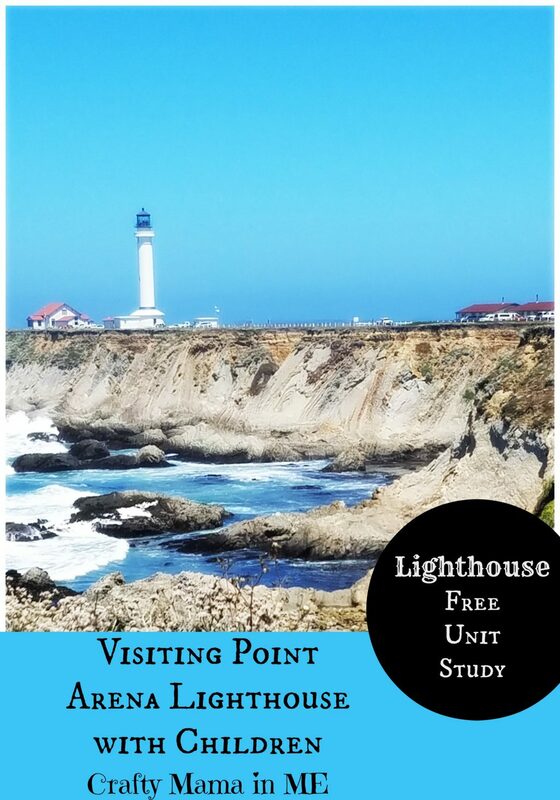 When you stay in any of the Point Arena Lighthouse accommodations you essentially have private access to the lighthouse property after hours. As we continued walking we passed the lighthouse and headed into the gift shop and museum. When you enter the gift shop you speak with the person working at the desk and get placed on a tour for the museum and lighthouse. The first part of the tour is the museum – we missed this portion and joined the group as they headed out for the lighthouse. 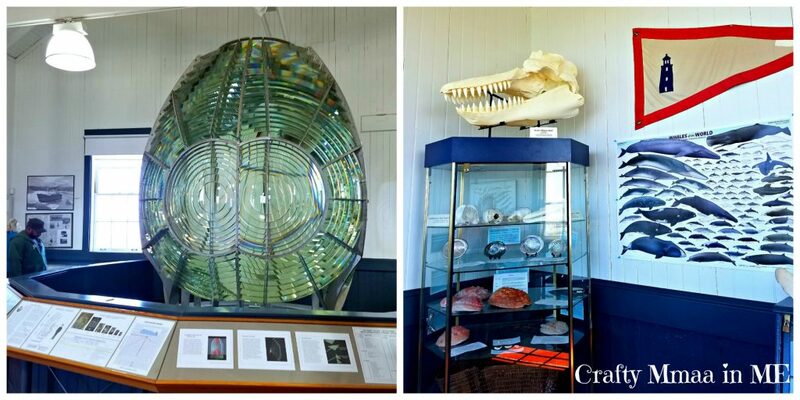 We visited the museum on our own after our lighthouse tour. 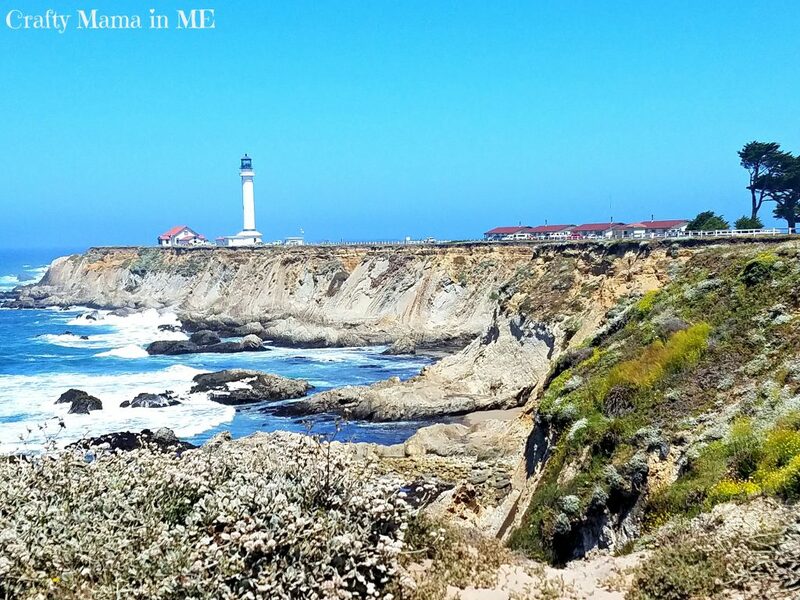 The Point Arena Lighthouse is 115 feet up which equals 145 steps from the ground – it is also the tallest Lighthouse on the West Coast! The lighthouse has four landings where you can pause to rest if needed. When you reach the top of the lighthouse you are met by a tour guide who talks about the local area and the history of the lighthouse. The tour guide told us that the lighthouse is still active but the old fashioned light has been replaced by a LED light that is computerized. The original 1908 First Order Fresnol lens was removed from the lighthouse tower in 2009 and is now the centerpiece of the Museum. The view from the lighthouse were amazing! We happened to visit on a clear day and the kids were so happy to climb to the top and look out. After we had our fill of the views from the top we headed back down and into the gift shop and museum. We visited the museum and the kids were excited to see a penny squisher machine. They each picked a design and added them to their California collection (you can find a list of the places to squish pennies here). We visited the exhibits at our own pace which I find to be a much better option for families with small children as you can move as fast or slow as you want. Buddy was really interested in the whale bones that were on display. After we finished in the museum we browsed in the gift shop before heading out to walk around the grounds for a few minutes. The grounds are beautiful and are available for private events. I think it would be a beautiful setting for a wedding!